“Good evening everyone and welcome to City Hall. Welcome to Be Black and Shine, a celebration of our City’s vibrant, diverse black community! This is a very special night as it is the first time my office has co-organized tonight’s event, and I anticipate many more to come. Tonight’s event is a great example of what we can achieve when community organizations and the City work together. Our City’s vibrant and diverse black community whose contributions have helped make Mississauga one of the best places to live in the world. Events like tonight’s are so important. They provide our entire community with the opportunity to celebrate and explore the culture, heritage and history of Black Canadians. We are a truly a diverse city and a key part of that is ensuring that we understand and truly embrace one another with open arms. 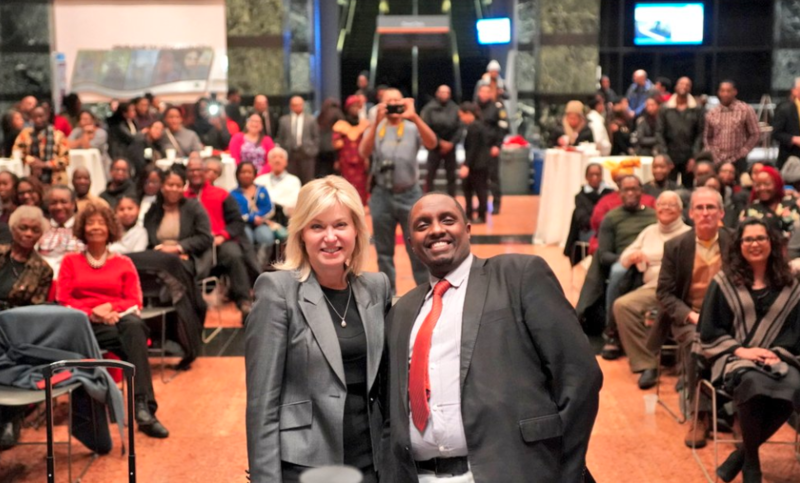 I want to thank Mississauga’s black community for the opportunity to co-host this event with you tonight and to thank you for the positive impact you are having in our community as leaders, city-builders, innovators, entrepreneurs, change-makers and so much more. Black History Month is as much about reflecting on the past as it is about the present and the promising future ahead. It is a time for us to honour and celebrate the many achievements and contributions that Black Canadians leaders, including our City’s black francophone and LGBTQ communities, have made to our City, province and country. It’s a wonderful reminder to celebrate our City’s diversity and the beauty that is Mississauga. It also reminds us of our responsibility to remain steadfast in the fight against racism and social inequality. It’s a reminder to recognize and remember the achievements and milestones of the pioneers who came before us who are rooted within the dynamic fabric of black culture. It’s also an opportunity to celebrate black leaders in our country, from Viola Desmond and Mississauga’s own Oscar Peterson to Andre De Grasse and the Honourable Ahmed Hussen. And many more leaders here today, who are helping shape our future by breaking through barriers and abolishing stereotypes. At the same time, we must acknowledge that the incredible contributions of far too many Black Ontarians have often been overlooked and they have been subjected to racial injustice. Mississauga is a City where everyone has an equal opportunity to achieve and be recognized for their success. We are known as one of the most culturally diverse and inclusive cities in the world. It is the cornerstone of our identity as a City. And it’s something that we need to work hard at each and every day to maintain because the unfortunate reality is that there are people in this world, and in our city, who seek to divide us. To those who do, I send a strong message – you are not welcome in our City. Mississauga is a place where everyone can thrive, regardless of your race, religion, colour, creed, sexual orientation, gender, age or if you have a mental or physical disability. This year, we turn our focus and efforts to empowering females and members of our LGBTQ community to stand up and speak out. And in return, that our community not only embrace them with open arms but empower them as leaders in our City, our province and our nation. As a proud PFLAG parent, I am all too familiar with some the real barriers that members of our LGBTQ community face. We must recommit ourselves to being a strong voice and advocating for equality and change at each and every opportunity. In Mississauga, we are committed to providing equal opportunity for all and when we move forward, we do it together. The theme of this year’s event is the UN’s International Decade for People of African Descent which calls on the world to strengthen cooperation across the world to ensure that people of African descent are able to equally enjoy and fully participate in all aspects of our society. It calls on all levels of government to ensure that rights are recognized – equally and without discrimination. To ensure that everyone has access to justice, and are treated equally before the law. This includes eliminating racial profiling practices such as street checks as we have done in Peel. And last but not least, it recognizes that poverty is both a cause and consequence of discrimination and that all levels of government around the world have a role to play in eradicating poverty and social exclusion. It’s also a stark reminder that while we are all truly blessed to call Mississauga home and Canada for that matter, there are billions of people around the world who continue to fight for basic human rights, access to justice and the supports they need and deserve to climb out of poverty. During Black History Month and year-round, I encourage you to take the time to explore Black Canadian history, immerse yourself in the many cultures that make up this beautiful community and reflect on ways our city can further embrace its diversity. Well it might be a bit too late this evening to visit the Central Library, be sure to head on over at some point this month where you can view even more stunning art pieces by our local community black artists. And, on your way out tonight, bundle up, head out to Celebration Square and have a look at our clock tower, which we have lit red, green and black, the Pan African colours, to commemorate Black History Month. Take a few minutes to reflect on why this month is important to you and what we can do together, as a city and as a community to keep this conversation going year-round.